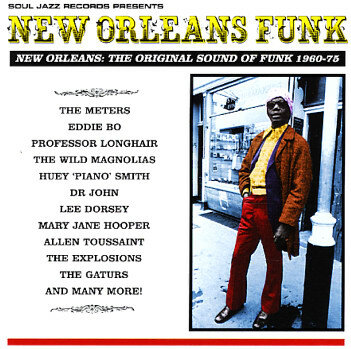 One of the best compilations of New Orleans funk we've ever seen! Sure, the reissue market is always filled with stuff from the Crescent City – but so many New Orleans compilations are cheapo knock-offs, designed to cash in on the drunk Jazz & Heritage crowd, or they're simplistic sets with the same 10 tracks over and over again. This wonderful batch of tunes was put together by the folks at Soul Jazz – legendary for their work in putting together serious compilations to please the novice and expert alike – and it's got some of the best overall work we've ever seen in trying to pin down New Orleans funk. Sure, there may be a few cuts on here that you've got on other sets – but there's also a lot that you won't have, and the quality of the production makes even the familiar material sparkle again. Titles include "Hercules" by Aaron Neville, "Big Chief (part 1)" by Professor Longhair, "Tell Me What's On Your Mind" by Cyril Neville, "Who's Gonna Help Brother Get Further" by Lee Dorsey, "Hand Clapping Song" by The Meters, "Here Come The Girls" by Ernie K Doe, "Sissy Walk" by Sonny Jones, "Free, Single, & Disengaged" by Huey Piano Smith, "Garden Of Four Trees" by The Explosions, "Mama Roux" by Dr John, "Love Lots Of Lovin" by Lee Dorsey & Betty Harris, "I've Got Reasons" by Mary Jane Hooper, "Gatur Bait" by The Gaturs, "Hip Huggin" by Robert Parker, and "Can I Be Your Squeeze" by Chuck Carbo. 24 tracks in all! © 1996-2019, Dusty Groove, Inc.